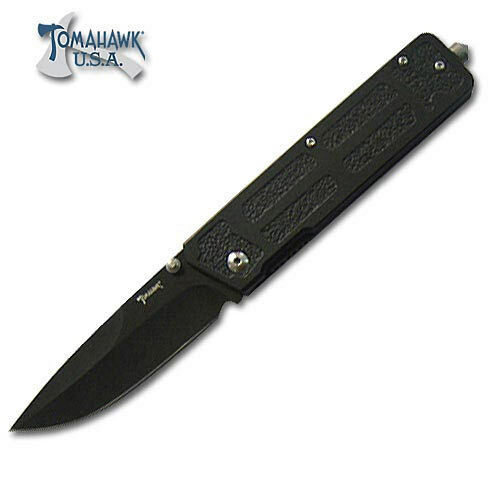 All Black Shadow Folding Knife | BUDK.com - Knives & Swords At The Lowest Prices! This is an ideal folding knife to have on hand for daily tasks or in an emergency. This folder features a 3 1/2" stainless steel drop point blade with swage for added power and a thumb stud to aid in easy opening and closing. The black aluminum handle offers a sand paper inlay to ensure a reliable grip, liner lock mechanism, and sturdy window break tip. This folder measures 4 1/2" closed and includes a handy stainless steel pocket clip. Tomahawk, XL1323.